I’m back, and this time with a doozy. 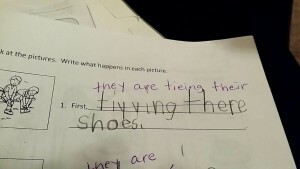 A friend’s six-year-old, first-grader recently submitted this to her teacher. The teacher “corrects” it and this is where the problem begins (and ends). Who, in the last 100 years, has learned to spell it that way? What respectable, educated teacher, teaches that? Find me one (more)! There really isn’t much more I can say about this other than my usual sign-off . . .